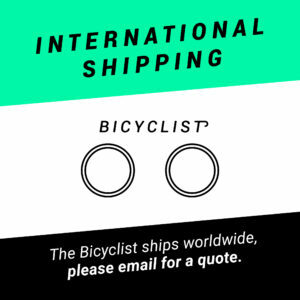 As a life-long bike nerd, vintage bike collector and cycle industry veteran the Bicyclist is my attempt to offer hard to find, great quality components in an easy to use and information-packed way. Despite having seen the march of technology in the bike industry first-hand over the years I realised that my friends and I were still riding around on old bikes, but we were enjoying it and loved the thrill of trying to piece a bike together or keep a favourite bike on the road and looking as good as it always had. Unfortunately as the bleeding edge pressed on we found it harder and harder to get the good quality parts we wanted as a perceived obsolescence stopped the mainstream shops from supplying appropriate parts and accessories. Everything we sell* is unused and ‘new’, whether it’s new old stock (NOS) resourced from the world over and saved from dusty back areas of bike shops, or newly made retro or classic parts from those companies still making great quality kit, or parts in increasingly obscure or scarce sizes. The bikes I ride span many decades and all genres, so the stock will represent this, if it’s of a good quality, not available elsewhere or just a beautiful part we’ll stock it. There is no defined cut off point, but don’t expect to find anything carbon fibre, disc brakes or suspension – unless it’s vintage, all of these things have been around for a long time! * With the exception of some of the items in the ‘ephemera‘ category.